Betty Ramirez-Lara, the first Hispanic woman governor for Rotary's District 5930, is photographed Thursday, June 1, 2017, in McAllen. 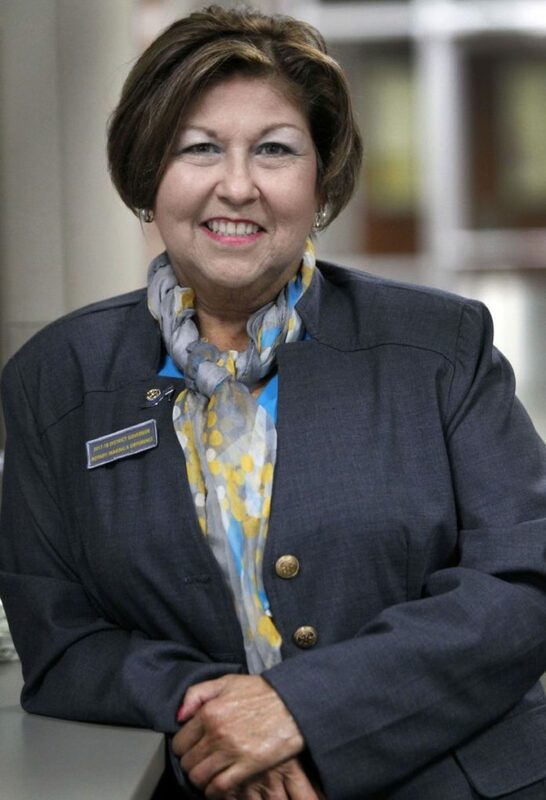 Betty Ramirez-Lara is the first Hispanic woman to be appointed a governor of Rotary International District 5930 which encompasses 52 clubs from Victoria, down to the Rio Grande Valley, and Laredo. Her term as governor will begin July 1 and she joined The Monitor for a question and answer session last week. Below is a transcript of the conversation which has been edited for brevity and clarity. What is a rotary and what is its purpose in a community? Rotary has been around since February 1905 and it was an organization that started out of Chicago, Illinois and it was some business people – Paul Harris, he was an attorney – and he had several of his friends and they would rotate their meetings. It started as a business fellowship but it is 1.2 million Rotarians around the world and we all are the biggest service organization and it keeps growing in many countries. Our main purpose is to continue our mission in humanitarian service. What is the hierarchy set-up? The world headquarters is in Evanston, Illinois, and it’s spread out in over 200 countries and there’s 530 districts around the world. In each of those districts there’s a district governor selected, so for July 1, 2017-2018, I’ll be one of those 530. How do you decide what your areas of focus will be? The areas of focus are very defined, such as education and literacy, and there’s maternal and child health care, and disease prevention. We have economic and community development. We concentrate on the local level but also on the global level where our communities partner with other countries like in Mexico right here across from us. We don’t have any borders and we have a hashtag “Rotarios sin Fronteras” (Rotarians without Borders), because we are a global organization. We’re trying to promote peace, too. We have a great partner which is the Bill and Melinda Gates Foundation. We’re trying to eradicate polio around the world. It’s been a journey of about 30 years, and they match our funds two to one every chance they get. What do you currently do for a living and how does that affect or play into your role with the rotary? I’m a self-employed business person so I would say that in my daily life, Rotary does take about 90 percent of my life rather than my business. We’re very blessed, so a lot of people say, “I want to give back.” Well, to me it’s not about giving back, it’s about giving. Period. And I believe that I can touch more people and have an effect on more people by doing what I do. How do you reach out to people to begin that giving process? Well, I start locally in my club. McAllen has four clubs and I belong to one that is full of givers. They’re business people that have been part of this community and they’re the decision makers. One of the things that we want to do is expand it to younger people. We realize that we have a lot of competition out there because some people, for them it’s about the Cancer Society or other people are about Big Brothers, Big Sisters. We know that there’s a lot of organizations out there, however, our organization is very focused and it expands to those types of other organizations. We make great partners, actually. Do you have strategies already to reach younger people? Yes, I do. I surround myself with younger people. I think we need to be very relatable. I’m going to be 60 years old next year and before, I think you would have said 60 is kind of old, but I don’t feel old because I want to be around young people that I’ve learned so much from. I wouldn’t say I’m a social media junkie, but maybe I am. However, I want to be relatable; I want to learn from young people. I’ve developed a “Toot Your Horn” campaign where local communities are going to Rotary clubs that have been in your communities. You have to be able to toot your horn so people know what it is that you do. It was the Rotary clubs that started the first hike and bike trail here in McAllen, things of that sort. For a long time, Rotaries have said, “No, we don’t want to let people know what we do.” Well, it’s time we do because, like I said, we have a lot of competition out there. How has the Rotary changed since you first joined? It’s changed quite a bit because I’ve been in Rotary over 16 years and I’m homegrown; I’m from Weslaco. That’s where I got started and my job, a year later, moved me to McAllen. McAllen is more of a bigger city and you get some towns that are still doing a lot of things like they used to be done before and I’ve seen a shift, a transition, where McAllen is growing and you got a lot of people that are transplanting here from other parts of the world and they’ve been exposed to Rotary and they’ve been exposed to other places. In reading up about you, I learned that you didn’t attend college. Why was it so important for your children to attend college given your success? Education is empowerment. That’s the only way you can compete in the business world. I was very fortunate that I was at the right place at the right time every time. I don’t believe everybody has that ability and opportunity. I’ve always been a survivor and I’ve always been able to capitalize on my talents. What I’m able to do, I didn’t think my kids could do. They’re both educators and they love their jobs; it’s very gratifying. And for me, it’s very gratifying because I see what they go through and I don’t think I’d be able to be a teacher, honestly. You have to have a certain skill level and you have to have a passion for it and I’m very proud of them. What are duties as governor and what will you be doing once you’re in office? Well, there’s 52 clubs and my main role is to help and support the clubs. Membership is a big focus for us. Our foundation is 100 years old this month, and our international convention is in Atlanta and we’re going to meet with everybody from the world. What is the significance of finally having a Hispanic woman lead this district? I think it opens the door to a lot of people. I think of the young girls, that there’s hope for them. You have to be impressionable to young people, to young girls that, you want them to get educated, to have a bright future.